Are you suffering from troublesome issues such as acne, anxiety, depression, muscle aches, respiratory problems, or insomnia? Or are you looking for an air freshener, antibacterial spray, or after-sun tonic without all those chemical additives? Whatever the matter at hand may be, there is a good chance that aromatherapy can offer you a noninvasive way to meet your need. Aromatherapy for Everyone provides easy-to-understand information on how to choose and use the essential oils that are right for you. 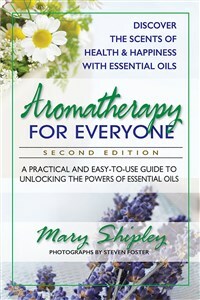 This revised edition begins by discussing the foundations of aromatherapy, touching upon its history and how it works. It then introduces the reader to the “aroma families” and explains how to build an aromatherapy starter kit, basic aromatic recipes and application methods, and how to protect and store essential oils. It also provides an all-new handy reference guide that matches problems or needs to the essential oils that may be applied to them. Finally, it presents individual entries for fifty-nine different essential oils, describing their origins, listing their therapeutic uses, and recommending ways to use them. Aromatherapy for Everyone puts the world of essential oils at your fingertips and includes full-color photos and fun facts that will educate and delight. Whether you want to take control of your health and well-being or simply create a unique scent for your living space, this book can show you how to do so naturally and effectively. Mary Shipley has been involved in natural healing and health care since the 1970s, and is an active organic gardener. The use of essential oils—or, as it is known today, aromatherapy —is appealing because of their user-friendly nature, versatility, and sensual properties. It has actually been around for centuries. People derive not only a great deal of pleasure from the use of theseoils but also myriad health benefits. Aromatherapy is a noninvasive way to take control of your health. Used in addition to other practices such as traditional Western medicine, yoga, meditation, diet, exercise, or holistic medicine, aromatherapy can strengthen your overall well-being and vitality. Because of aromatherapy’s growing acceptance in the United States, essential oils are now available almost anywhere you look. This is both good and bad news. Good, as it is now easier for you to incorporate aromatherapy into yourlife. Bad, as essential oils, for the most part, don’t come with instructions. This book aims to demystify aromatherapy by explaining its history and usage. It covers the basic essential oils, including their aromatic characteristics and therapeutic properties. It also points out how to choose a quality essential oil and helps you pick out a starter kit. You’ll also learn about combining oils for synergistic blends and the different ways aromatherapy may be incorporated into your life. The power of aromatherapy can strengthen you both physically and mentally. Many people have already experienced this power for themselves, and now you can learn how to do so, too, by using this easy-to-understand guide. After reading this book, you’ll fi nd yourself excited about the positive changes you can make in your life througharomatherapy. With a little bit of instruction, you’ll be able to safely and confidently integrate essential oils into your everyday routine and discover a “scentsational” new lifestyle to embrace and enjoy.